Diamond (Rnd and Bgt) Earrings (with Push Back) in 14K Gold Overlay Sterling Silver 0.500 Ct.
Amethyst (Pear) Earrings (with Hook) in Sterling Silver 1.250 Ct.
Rhodolite Garnet (Pear), Natural Cambodian Zircon Teardrop Earrings (with Push Back) in Platinum Overlay Sterling Silver 10.500 Ct. Silver wt. 7.60 Gms. Limited Edition-Buddhist Dharma Wheel Carved Green Jade (Rnd), Natural White Cambodian Zircon Earrings (with Clasp) in Rhodium Plated Sterling Silver 55.200 Ct.
ILIANA 18K White Gold UnHeated Natural Purple Sapphire (Ovl) Lever Back Earrings 1.330 Ct.
Earrings are a timeless piece of aestheticism that is responsible for being the most profound face framing accessory. Whether it is a simple or intricate earring, the charm it adds to your face is something unparalleled that no stroke of mascara, lipstick or any makeup for that matter may add. 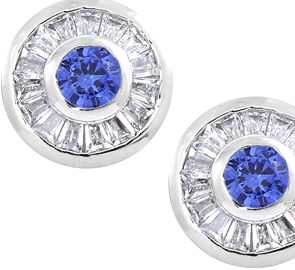 An add-on accessory to let you bling is definitely a gorgeous piece of earring. So having a collection of these gorgeous trinkets would blend with your style and let you usher some of the quintessential essences of freshness yet contemporary fashion. TJC understands that how deeply these baubles mesmerise you. So, here we got earrings auction to satiate your desires. TJC auctions are just great to take home some of the most fabulous styles at an unimaginable price. A large collection of most sought after designs and exemplary style is a want for every woman. And therefore, TJC let you feel the essence of such creativity and modish designs at such a stealer price through auctions. A fun filled and thrilling experience is auction wherein one get a wide array of products from jewellery, fashion, lifestyle, home décor to beauty. The fun is limitless and offers and deals that have no end. So, binge yourself shopping into this extravagant ride of sapphire earrings auction and ruby earrings auction wherein the shopping delights will let you ask for more. It is simple yet entertaining to place a maximum bid and if lucky you get to win. Yes, you get to win. Watch for your auctions in the watchlist and surround yourself with an eventful of opportunities and auction products to treat. Place you bid and get lucky to win it now from TJC. Even if you have lost an auction, there are many options to win it next time from your favourites. Diamond earrings auctions have been the love of many as being an expensive option to crack on, one would definitely want to grab it an unbelievable price. So, people place your bid to entice and be a part of the auctions.